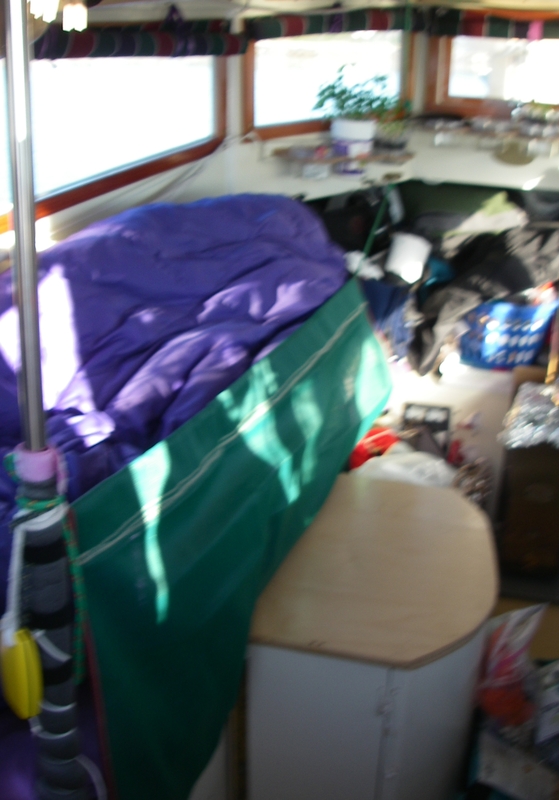 Last winter, one of the boat projects was to make and install a leecloth for the port berth, where I usually sleep. (Apologies for the fuzzy picture.) For those who are unfamiliar with it, a leecloth is a piece of fabric attached to the open side of a berth in such a way that it can be folded away under the mattress, or unrolled and fastened so that you can’t fall out of bed when the boat rolls. Long-distance cruisers use these routinely, especially for sleeping at sea. This project made it onto the list because of my interest in doing overnight passages, but it has been useful for so much more! First a description: this one is made out of Phifertek, a woven mesh, vinyl coated fabric that I got from Sailrite (just like always, I’m not getting anything for mentioning these names, and my only relationship with them is being a customer). This stuff is really strong, not prone to mold, and allows for ventilation if the weather is hot. It’s the same material that those blue mesh organizer bags are made out of, that come from the boat catalogs. It’s smelly when it’s new, but after it has sat around for a while it’s just fine. Suzanne and I got out the sewing machine, and between the two of us put this together. It has a double folded hem along the bottom edge for fastening to the wooden surface of the berth, which we later attached using wood screws and trim washers, spaced about 5 inches apart. The vertical edges on each end of the leecloth are covered with strips of sunbrella bias tape (that’s what those folded strips are called – they’re actually not tape with stickum, but something you sew on). This was easier and less bulky than folding and sewing hems, and works just as well for dealing with the scratchy edge of the Phifertek, as well as adding a little bit of strength, and preventing stretching at the edges. Bias tape is also more flexible than folded hems would have been, which has turned out to be really nice when it comes to folding the leecloth away when not in use. The top edge of the leecloth was folded over once for a hem, folded again with a deep fold to double the thickness in the top 6 inches of the fabric, and stitched. After this is when the bias tape went onto the vertical edges of the whole piece. Then the top edge was folded and stitched yet again, with two rows of zigzag stitching, to form a long, open-ended pocket that is two layers thick. The two layers of the pocket are for added strength, and the bias tape keeps things from being scratchy and ensures that the line that holds the whole business when in use doesn’t get put through the wrong layer of the pocket. On the boat, we through-bolted one of those hefty, oblong, two-fastener bronze pad eyes up forward and attached a sturdy line with a carabiner. That line runs through the pocket on the top edge of the leecloth, with a good bit of extra tail. In use, the leecloth is unrolled and stretched taut with that line, and the line is tied off on the vertical pole near the head end of my berth. One could just as well use another pad eye, but the pole that we put in for a handhold and for shoulder-bracing when lying down turned out to be perfect in this particular situation. A couple of turns around the pole and then two half hitches, with the second one slipped, makes a sturdy connection that’s still easy to get out of quickly. Originally, I did indeed use this setup for overnights at sea. It was quite good just as it was for preventing a fall, and then it finally occurred to me to put a firm, fiberfill pillow (which I fortunately happened to have on the boat) at my hips, against the leecloth, and the whole thing got really, really comfortable. At sea on a port tack, which means one is resting against the leecloth, it works like a hammock, feeling quite sturdy and reliable. A while after that initial use, I was anchored somewhere with a good bit of rolling – I can’t remember if it was from regular waves or boat wakes – and when it was time to go to sleep I thought of putting up the leecloth, just for extra insurance. What a treat! It’s amazing how much better I slept knowing that I didn’t have to stay alert for an extra big wave. It has now become routine that if there are any kind of waves at anchor, when it’s time to sleep up goes the leecloth. These days fall is coming along, and occasionally the nights have been pretty chilly – 40° outside, and down to about 50 inside the boat by just before dawn. One of those chillier nights coincided with waves and the leecloth, and I was surprised to find how much warmer I was. I have a variety of strategies for keeping warm, which I’ll write about separately, but it was a treat to find that just using the leecloth, with that big pillow alongside, significantly improved things. For one thing, the down sleeping bag that I use more like a comforter on top of everything else doesn’t fall off the berth! And assorted covers are held more snugly. It’s made a noticeable difference, and other things that I do to keep warm have not been as necessary. As a further bonus, with a little stray fleece clothing added alongside the bottom of the leecloth for padding, my berth is just enough wider to completely support both shoulders and arms without fussing to get into the exact perfect spot. Heavenly. At this rate, I’m going to start sleeping with the leecloth even when it’s flat calm!